This is a guest post written by Jason On. If you haven't guess yet, I ride a sportbike. 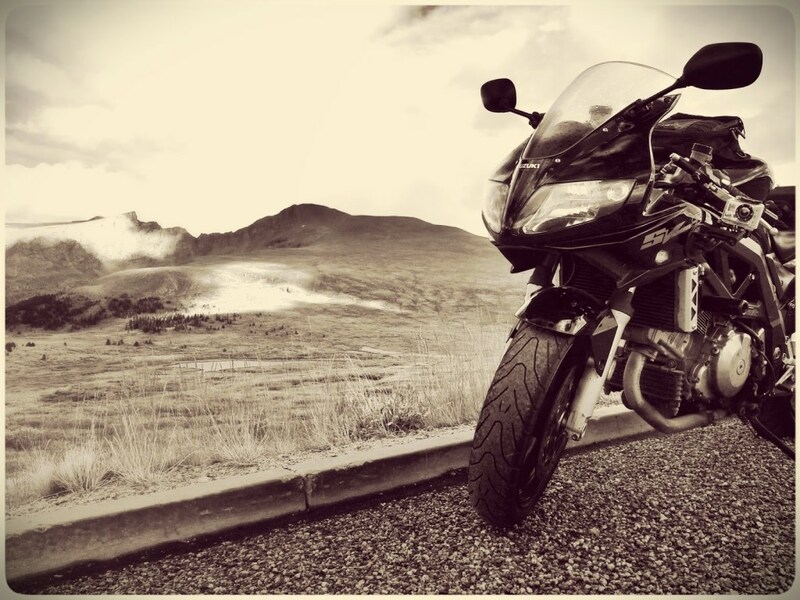 An SV1000s, to be specific. What I love about the bike is, not only can it keep up with the hyperbikes in the twisties of Colorado, but it's comfortable enough for commuting and longer rides. Especially after I replaced the stock seat with a Corbin one. That's right. Rule number one is don't die. You'd think I wouldn't have to tell people this, but since we're sportbike riders and we like to push our limits, not dying is something we don't always think about before kicking our stands up. Dying is bad, Mmm'kay. Again, this one seems self-explanatory, but sometimes you have to remind people of the obvious. 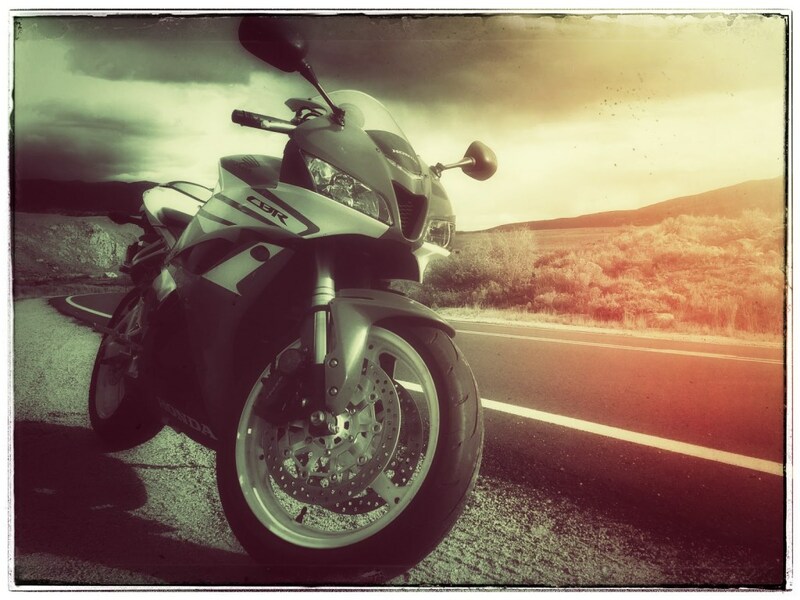 The truth is, some people are a lot more rational than others and most sportbike riders are wondering if they're going to get their knees down or their chicken strips erased more than they're worried about going down. Don't crash reminds them to keep the shiny side up and be aware and alert of their surroundings and actions. We're not all riding at the same level and even when we are, some people are just having a bad day. Maybe they went out drinking the night before, didn't sleep well, have a slight cold, or any of a thousand other reasons why people aren't up to their normal riding capabilities. Ride your own ride simply means don't try and keep up where you can't. If the person in front of you is riding beyond your capabilities, let them. It's not your responsibility to keep the group together or risk going down by taking that 35 mph corner at 90 mph. The sweep, a designated position, holds this responsibility. Since we all wear our gear, including helmets, hand signals are an important part of communicating while on the road. 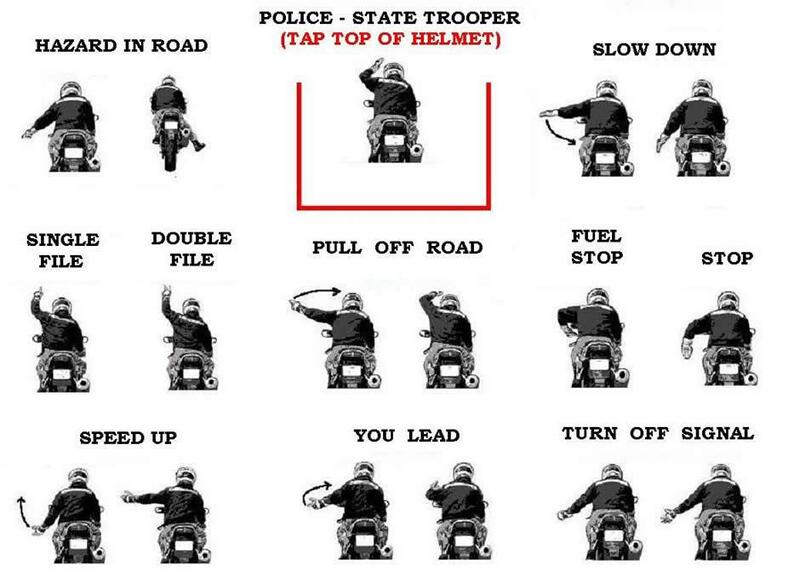 From left and right turns, to informing the riders behind you of a police officer ahead, hand signals are important. Each group or style of riding may have their own signals, the ones we typically encourage are: turn left, turn right, road hazard left, road hazard right, police ahead. For lead riders, with more advanced riders the signal to let others know if it's safe to pass on a double yellow or where visibility is compromised is also important to know. These signals have done the rounds on the internet - do you use any of them? Speaking of lead riders, each group ride is going to have a lead and sweep rider. Some might call them by other names, but in general, they're the first and last rider of a group. Both of these roles have their own responsibilities, neither of which is to be too fast or too slow. Leaders and sweeps should be in communication with each other via hand signals, the leaders ensuring everything is okay and the sweeps indicating if there is any problem with the ride. A lead rider must know the route the group will take. To be fair, everyone should know the route, just in case, but the lead rider should not only know it, but be familiar with the plans. They should know appropriate re-grouping points, refreshment locations and gas stops. 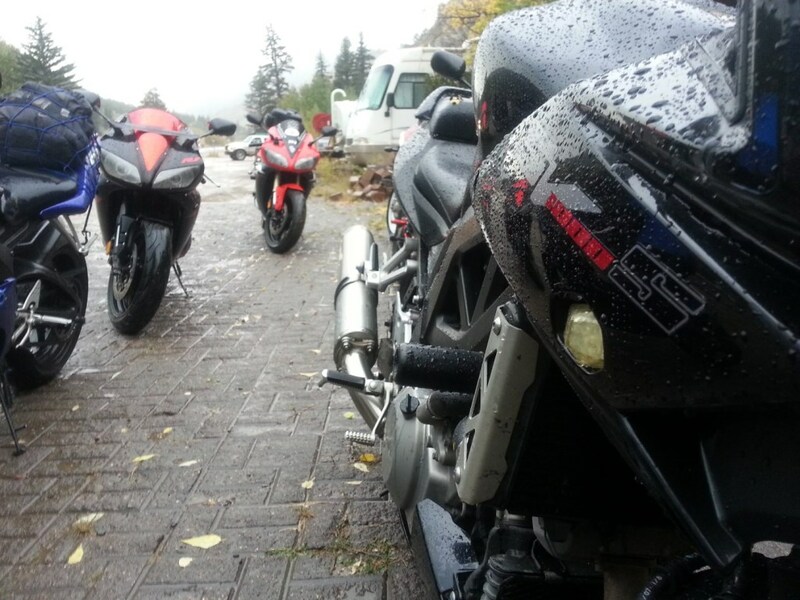 If the group is out for a leisurely ride, they should also know any points of interest. 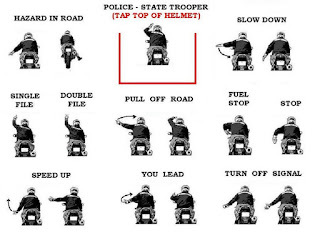 Leads have the responsibility of keeping an eye out for road hazards, police and a variety of other conditions that might affect the ride, the riders or be perilous to the motorcycles. One of the rules I personally have for group rides, and this applies to everyone, not just leaders is to keep the bike behind you in your rearview mirror. This serves a couple of purposes, to include keeping the group together and ensuring the riders in front don't keep going if there is a mechanical issue, or worse, behind them. It also ensures the lead rider doesn't get too far ahead and run into their own problems, possibly going of the road as the remainder of the group rides on by. Many people mistakenly believe that the sweep rider must be the slowest rider in the group. This is false. The sweep rider needs to be as experienced or even more experienced than the lead rider. Like the lead, the sweep needs to know the route or any waypoints the group might stop at; he, or she, also needs to know how many riders are in the group, and should know the answers to basic mechanical questions should anyone have a problem while out for a ride. A preference list is to have a cellphone that works in all areas in case 911 needs to be dialed as well as basic first aid skills should they be needed. It is the sweep's responsibility to make sure the entire group stays together. They aren't to leave the group and, like the lead, they shouldn't leave their role for a different position in the group. A quick way to be banned from rides I organize is to be a sweep and abandon a rider in pursuit of a more spirited ride. In smaller groups, this may be okay, depending on the riders involved, but in larger group rides, where experience levels vary greatly, this behavior is a major no-no. For those of us pushing the envelope, the police can be a major buzz kill. They pop out of nowhere, sitting behind signs or off in a hidden driveway. Sometimes they are heading your way in the opposite direction and sometimes they're behind you just waiting for someone to break a rule. Remember, in most places, the police can only pull over one vehicle at a time. They cannot pull over a group. Typically they will light up the sweep (so the sweep should be properly licensed and insured) but on occasion they will split the group and single out a specific rider. While this is happening the remainder of the group needs to keep moving until they arrive a predetermined way point or refill/refreshment stop to wait for the pulled over individual. Otherwise, an unethical policeman will try and ticket the entire group letting the courts sort out the confusion. When riding with a smaller group, say three or four, no more than five, the group may not need a dedicated lead or sweep, hand signals or anything else, especially if the riders are comfortable with each other. However, with a larger group, eight, ten or fifteen bikes, a dedicated standard of rules is detrimental to a good ride with the least amount of issues. Remember, we're all here to have fun and one downed rider or incident with the police can ruin a good time for everyone.